Discover our product solutions & determine a fit for your business. You can procure food service equipment from any number of sources. But to maximize results and drive profitability, you need a business partner that understands the unique challenges of your operation. Duke is a global leader in mass customization in the food service industry, with more than 80 years of experience in helping clients large and small cut costs, enhance quality, lift sales and improve profit margins through integrated solutions that impact all phases of workflow from start to finish. Over the past five years alone, we have delivered quantifiable cost savings for our customers in excess of $25 million. We developed a broiler program for BURGER KING that produced savings of 40-60% annually versus their preexisting equipment. 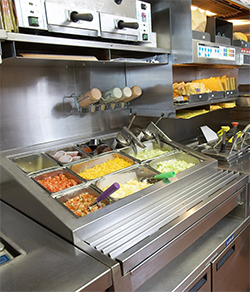 For Taco Bell, we designed and implemented an equipment retrofit program that allows their restaurants to eliminate water from hot holding, generating significant savings in both energy use and maintenance. For SUBWAY RESTAURANT, we established a consolidation program that lowers freight costs, reduces damage in transit and, perhaps most significantly, enables the chain to now open new stores three days faster than before. Whether it’s our expert culinary team assisting you in delivering GOLD STANDARD food quality or our award-winning engineering team working with you to realize increased energy efficiencies, everyone at Duke understands that our bottom line is only as healthy as yours. Today’s fast-paced, hyper-competitive environment puts a real premium on ongoing innovation and continuous improvement. At Duke, these qualities are deeply ingrained in our corporate culture and way of doing business. Since 1998, for instance, our investment in research and development has grown 300%, or 12.8% CAGR. Our engineering headcount has grown 150% over the same time frame. We believe our clients deserve access to world-class processes, people and facilities, as well as a flexible approach to manufacturing that emphasizes customization, responsiveness and speed to market. To that end, we invest not only in state-of-the-art hardware like robotics and laser cutting and welding equipment, but also in process enhancement and best practices through utilization of Six Sigma, Lean Manufacturing and 5S. Our commitment to innovation has yielded impressive results, enabling us to launch five new platforms over the last five years, which have collectively generated in excess of $90M in sales. Better still, our expanding list of business partners include many of the fastest growing, most dynamic and forward-thinking names in the food-service industry. Partner with Duke, and position your operation for growth now, and in the years ahead! We can quickly “ramp up” our vast production capabilities, logistics and service networks to rollout equipment to global restaurant systems. The variety of our client base, our 90 years of manufacturing and design history, and the scale and scope of our global operations enable Duke to handle all of your needs – whether those needs are as basic as new cold holding units for your backroom, or as complex as the creation of a completely redesigned kitchen and food-handling environment for your restaurant. A proven system in place to ensure on-time delivery, correct installation and operation. Our global consolidation service provides customers with a significant benefit – all equipment requirements for a store are managed, received, cross-docked and shipped as a complete store package. This affords lower freight, handling and freight damage costs and improves the speed of restaurant openings. Where is your operation heading next? Work with Duke, and we’ll help take you there! What separates solid, well-run organizations from those recognized as best in class? If you ask us, the answer is vision– the kind of vision that doesn’t merely anticipate the future, but rather shapes and molds it to a desired end. Over the course of our long history, Duke has been privileged to partner with several truly visionary operations, large and small. Some have been fast growing, overtly entrepreneurial businesses that needed to manage and rationalize rapid expansion. Others have been established category leaders seeking new avenues for growth in a seemingly saturated market. 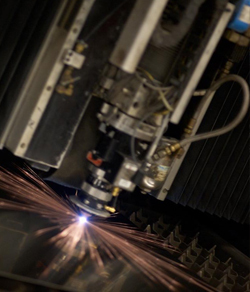 In either environment, Duke offers the flexible manufacturing capabilities and advanced engineering you’d expect from a top of the line equipment supplier, as well as that inspired spark of imagination that comes from a business partner that shares your aspirations and understands your business nearly as well as you. We are culturally driven to be flexible and customer focused. We keep our customers engaged in every step, throughout the development process, ensuring their satisfaction along the way. We keep our customers engaged every step of the way throughout the process which ensures their satisfaction. They are involved in field testing through validation of equipment performance. Their input is sought for serviceability and functionality enhancements. As a result, proof of concept develops rapidly through to prototype. Advanced engineering is a key Duke competitive advantage. Our gated New Product Development (NPD) process has increased speed to market, minimized costs and exceeded our customers’ expectations. Our strong base of core engineering competencies include: 3D CAD solid modeling, microwave network analysis, combustion gas analysis, electronics development tools, thermal imaging camera and energy efficiency optimization. Our in-house accredited UL test facility enables us to keep costs low. Our processes, people, and 680,000 square feet of production space are world-class. We are vertically integrated to propel and control supply chain responsiveness. Our cultural bias towards insourcing versus outsourcing and our leveraging of global sourcing supply agreements allows us to minimize costs and ensure a consistent supply of materials. This also allows prototypes to be created in our manufacturing facilities where components are readily available. We have extensive technology partnerships to supplement in-house development capabilities. Integration of digital electronics, including electronic controls, web and Windows™ based interfaces and wireless technologies, into equipment designs improves ease of use and food consistency, and delivers GOLD STANDARD quality. Our strong commitment to developing customer-focused equipment solutions and our consistent investment in long-development “game changing” technologies, have often led to broad-market equipment solutions.